Mini has undeniable brand cachet – adored by boy racers and fashionistas alike. 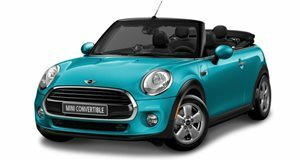 The Cooper Convertible tends to sway more towards the latter group, but who said a fashion accessory can’t be a driver’s car too? 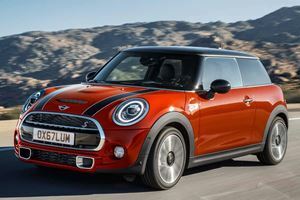 The Cooper S and JCW derivatives offer just that – hotter versions of the soft-top supermini to create arguably the fastest fashion accessory this side of a set of Ferrari luggage, and at probably the same price as the luggage too. Potent turbo power, BMW engineering beneath the surface and exciting front-wheel drive dynamics all combine to make the Cooper S and JCW convertibles live up to the go-kart legend that precedes them. Though the Mini may not live up to its name on the outside, the inside is quite snug. Despite benefiting from BMW’s knowhow, the ergonomics aren’t without fault. Perched on comfortable front seats behind the three-spoke steering wheel, the headlight switch is mounted low near the driver’s left knee and angled downwards The center arm rest between the front seats is hunky and awkward too, and interferes with a comfortable grip on and movement of the standard manual shifter. The rear seats are cramped, but are usable by small occupants over shorter journeys. The folding soft-top, when closed, still offers decent head room, and when opened stows neatly behind the rear bench seat. The roof and its mechanism also eat into cargo volume, chopping out 3 cubic feet from the trunk when compared to the 2-door hard top to leave the figure standing at a paltry 5.7 cubic feet. Go-kart handling has always been a strong selling point for Mini – and this generation is no different. 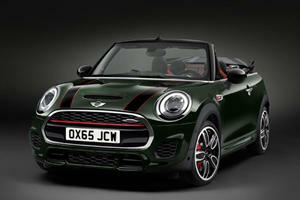 Though front-wheel driven the Cooper S and JCW convertibles both have fairly neutral chassis setups. When pushed beyond their limits they’ll understeer, but deft lifts of the throttle and light brushes of the brake pedal can easily induce oversteer. The suspension on both errs on the side of firm – but not upsetting to the overall balance. There’s good grip over mid-corner bumps and over broken surfaces the dampers respond rapidly enough to keep the ride fairly composed. 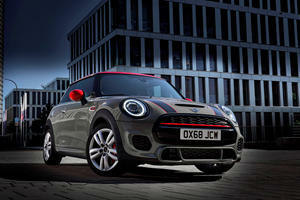 The JCW compromises the ride more, though, being even firmer and ready for track duty. However, the downside to both is that the soft-top convertible removes a significant chunk of the torsional rigidity. String either model through a series of directional changes and the lack of strength becomes all too apparent – forcing you to back off sooner and keep things at a maximum eight tenths. Generating the Mini Cooper Convertible S and JCW’s propulsion are the same engines you’ll find in use in the hard top version. They’re both 2.0-liter turbocharged 4 cylinder motors, though the S features distinctly lower outputs of 189hp and 207 lb-ft of torque. The Cooper JCW turns the wick up by 39hp to 228, with torque climbing to 236 lb-ft, an increase of 29 units. Drive is sent to the front wheels in both models via a standard 6-speed manual shifter from Getrag. A 6-speed automatic is available on both, though only the JCW gets the option of the 6-speed Sport Automatic with shift paddles mounted on the wheel. The Mini game is all about personalization, the S and JCW convertibles are no different – with a range of colors, trim options, and a Union Jack soft top all available, the sky’s the limit. Standard equipment is well specced on these high trim models, featuring a 6.5-inch touch screen infotainment system and a 3-way roof. Optional equipment includes navigation, park assistant, heads up display, and adaptive cruise control. A range of packages are available that include everything from suspension upgrades to heated front seats. Available safety features include active roll-over protection, 6 airbags, ABS, ESP, and front collision warning. The open air experience with the Mini Cooper is one with a long history, but with the Cooper S and JCW convertibles, open top motoring takes on a new, fun dynamic. With the compromised body shell, the extra power of the JCW isn’t exploitable in the slightest, so the Cooper S is the pick of the lot. A celebration of everything British, courtesy of the Germans.